Home or Commercial Waste. We're Just a Call Away! On average, every Australian household produces approximately enough rubbish to fill a three bedroom home from floor to ceiling with junk every year. The statistics can be scary when looked at closely. Thankfully the practice of recycling has grown immensely over recent years. Sometimes you may find that you have more trash than the curbside garbage service can deal with – that is why you need Same-Day Rubbish Removal. We will deal with your waste fast and responsibly so that your small rubbish problem doesn’t become a big one! No matter what size job, our friendly team will be there to clean up your Inner West home or business. At Same-Day Rubbish Removal, we offer a wide range of junk removal options to suit your needs. Whether you’re a large business wanting to remove piles of old equipment that has been getting in your way or if it’s just a large old washing machine that has broken down that is too hard to shift (or can’t quite fit in your curbside bin!). In our combined years of experience removing waste, there’s not much that our team hasn’t seen. What you’d probably see as a huge job, our friendly team will make it look like an easy job. Whether you’ve got old beds, mattresses, broken washing machines, dryers, tables, or chairs that need to be removed, our team can have it done fast and affordably. Few people intentionally want to destroy the environment, but most people don’t consider the negative effects their personal rubbish production can have. With services like ours, garbage disposal couldn’t get much easier. Our team would hate to think that our easy service is facilitating the destruction of the environment, which is why we do everything we can to dispose of your waste responsibly. Wherever we can, we sort the junk and have all items that can be recycled taken to a recycling centre. We also encourage people to try reuse or repurpose their items before having them disposed of. If you’ve got rubbish you’re feeling guilty about, call the Inner-West’s most responsible waste removal company so that we can make sure your junk is disposed of ethically. You’ve probably thought about hiring a skip bin, it sounds like a more affordable option, as you’re not paying someone to do all the work. However, Same-Day Rubbish Removal have streamlined their service so that this is not the case. Hiring a skip bin takes two trips to drop off and pick up the bin, as well as the cost of hiring the bin itself. Additionally, skip bins can be quite an eyesore while they’re on your property, and they can leave large patches of dead grass when they’re taken away. Taking your junk to the nearest trip yourself is usually what people would consider the cheapest. If you’re time poor like many Inner-West residents, this option can be quite costly. If you don’t have a ute or trailer it can be quite an inconvenience and be a lot of hard work. Our team are able to do everything in one trip, while also making it an easy job for you. 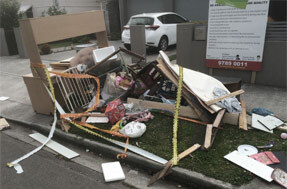 For this reason, we are the best value waste removal service you’ll find in the Inner West. 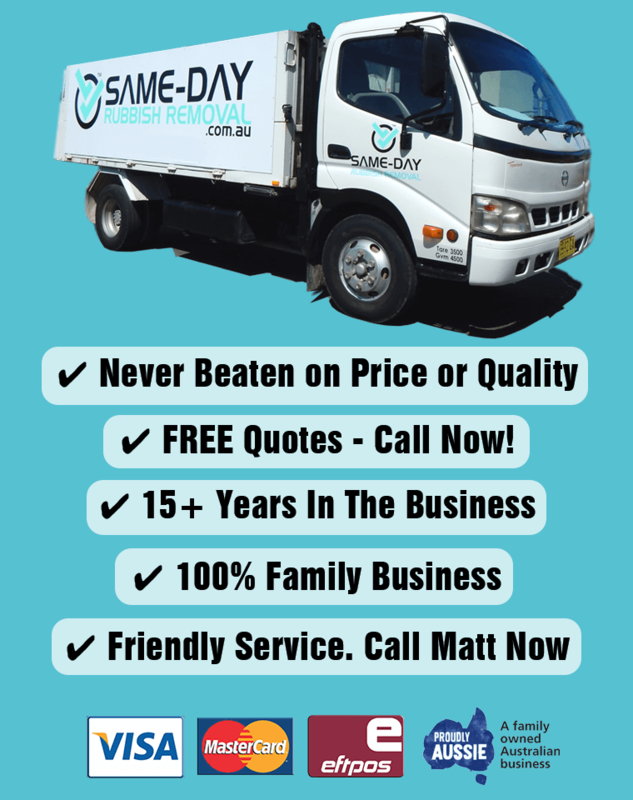 Same-Day Rubbish Removal service all areas within Sydney's Inner West, including Balmain, Croydon, Homebush, Leichardt and Strathfield as well as all surrounding suburbs. Our fast service actually covers most Sydney areas from Liverpool up to the Northern Beaches, including all suburbs in between such as Sydney’s CBD. Why not get a free, no obligation, quote right now? 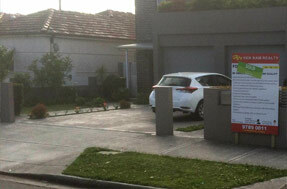 (Call 0402 737 046) Our team will make sure that your place is left looking great, with not a piece of junk in sight. You hardly have to lift a finger, just let us know what needs to be taken away. Don’t let that pile of rubbish sit in your yard any longer, let our experienced team take it away today. Call us now.